The not-so-common navicular stress fracture is a serious type of overuse injury involving a boat-shaped bone of ankle present at the top of the foot arch. Commonly seen in athletes, gymnasts and people involved in sporting-type dynamics, the fracture is difficult to diagnose, which is why the incidence reports vary. What Is Navicular Stress Fracture? 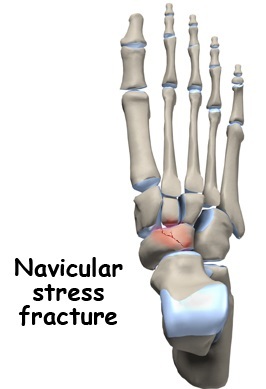 Navicular stress fracture is an injury marked by an incomplete crack in one of the mid-foot bones. Like all the other stress fractures, this overuse injury is a result of excessive and repetitive compressive forces that act on it during the weight bearing process. These forces initially cause a bone stress reaction and continuous damage eventually leads to fracture. How Does Navicular Stress Fracture Feel Like? Patients who develop this fracture present with a chronic, vague ache in either top or mid-foot that radiates towards the arch. The pain is aggravated by physical activity being more pronounced during a change in the intensity or duration of activity and is relieved by taking rest. The poorly localized pain has a gradual onset and is present in one foot only which also has a tender sole. Other complaints with which the patients present include a tendency to limp and swollen ankle. Why Do I Get Navicular Stress Fracture? Certain foot types are more prone to fractures. Navicular stress fractures are difficult to diagnose and apart from imaging studies, physical examination findings are also taken into consideration. On physical examination, there is tenderness and pain when standing on toes or hopping is attempted. If X-ray doesn't show a fracture, a bone scan, CT or MRI can be used to confirm the diagnosis. These studies also show if the fracture is complete or incomplete. Managing Navicular stress fractures serves to be a great challenge for surgeons partly due to the extensive force that the bone absorbs during movement and partly due to the poor blood supply. Whether the fracture will require surgical intervention or not depends on the severity of injury. Stress reactions where the bone's outer part has not been damaged can be very well managed non-surgically. You should take weight bearing rest with the help of a walking splint till there are no more symptoms and the patient has fully recovered. In case of stress fractures, there should be complete non-weight bearing in a full cast for 6 weeks. The site is re-assessed after 6 weeks by feeling the N spot over the dorsum of the foot and if it's still tender then a cast is re-applied and foot immobilized for 2 weeks further. In case of failure to heal or bone separation, surgical treatment is sought for proper bone realignment. This involves holding bone in place either with the help of pins and screws or a metal plate, followed by casting or splinting. The immobilization period is followed by a rehabilitation phase during which strengthening and ankle mobility exercises are done to restore ankle strength and mobility before the foot is fit for functioning. Exercises for small muscles of foot and calf raises play a vital role in this phase and the recovery can be further speeded up by sport massage for the calf muscles. Exercise alone, however, is insufficient and it is best to keep a tab on factors that can result in an injury again. Few of such factors include overtraining, faulty training techniques, an over pronated foot, tarsal coalition and restricted dorsiflexion.